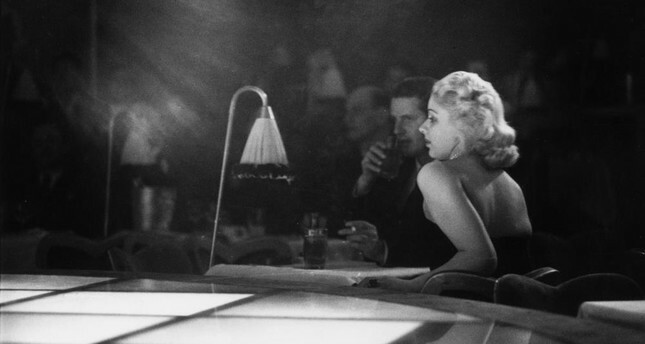 9th December 1950: A couple sitting next to the stage for a floor show at “La Nouvelle Eve,” the newest and most expensive night spot in Paris. Leica Store was silent when I visited during an afternoon last week. A young woman was working with her laptop behind a long table, covered with photography magazines, and a lady from the cleaning staff was looking at one of the photographs on the wall. Sharply dressed sales assistants were ready to serve customers on the lookout for Leica cameras which seemed a bit out of my budget. This lavishly designed shop also serves as the entrance to Leica Gallery, an exhibition space long awaited by Istanbul's photography community that opened its doors at the end of 2016. "From Strasbourg to London - From Hubschmann to Hutton", Leica Gallery's new exhibition, is devoted to the British photographer Kurt Hutton and makes your visit to Bomonti, where the gallery is located, absolutely worthwhile. "In order to point out to Leica's significance in the history of photojournalism we wanted to host a pioneer's show during the first season of Leica Gallery Istanbul," Yasemin Elçi, the manager of the gallery, told me. Born in 1893 in Strasbourg, Alsace, Kurt Hubschmann (the surname changed to Hutton after he became a British citizen) was a pioneer of English photojournalism. After studying law at Oxford, the young German discovered that he was not at all interested in the world of courts and solicitors. After the outbreak of World War I, Hutton became an officer in the German Cavalry, learned photography techniques and opened a studio in Berlin. Before he settled in London in 1934, he contributed to a number of German photography magazines, including the Berliner Illustrated and the Munich Illustrated Press, using small format cameras that helped him combine artistic experiments with his journalistic work. "Kurt Hutton was a perfect name for our choice to show Leica's place in photojournalism," Elçi said. "He is a new name for our audience and one of the hidden founders of British photojournalism. It is crucial to know the history of photography to better comprehend today's art world. So, our first seminar at the Leica Academie was the history of photography. During Hutton's show we will focus on the history of photojournalism and Hutton's importance at this era as well as political magazines like Picture Post and Weekly Illustrated." It was in these two magazines, where he worked as a staff photographer, that Hutton would make his name. "Working for Picture Post, at the height of its success, Kurt Hutton photographed an unprecedented variety of famous people, ranging from King George VI to Ernest Hemingway, Bertrand Russell to Lloyd George," Elçi explained. "For me, a typical Kurt Hutton shot is unforced, natural, taken from life and instantly iconic." There is pleasure in seeing Hutton's pictures of Alfred Hitchcock and Ingrid Bergman next to another work depicting poverty in post-war England. He also took pictures during the Nuremberg War Crime Trials, and the famous image of Nazi leader Goering, sentenced to death in 1946, is unsettling. Those images are presented alongside a work that depicts Hollywood life, showing a couple in an open-top car in the Olympic drive-in theatre. In another picture, a tutor at Laval University in Quebec plays pelota. Darker images of urban life are even more striking. A 1951 work shows a woman buying a film ticket at the Egyptian Theatre in Hollywood Boulevard. The image feels like an Edward Hopper painting, with its dark street populated by the ticket seller and her customer. "There is not a single definition for the city of London as photographed by Kurt Hutton," Elçi said. "Hutton had become a British citizen to hide his Jewish identity during World War II. In England he photographed the homeless people in the East End of London, backstage of fancy fashion shows, politicians, working women of his time as well as important events of his time and famous people like Ernest Hemingway and Albert Camus. His work can be read as social history." After his retirement, Kurt went to live in Aldeburgh with his wife. In this small town on the east coast of England he met British composer Benjamin Britten. "Britten was aware of Kurt's work form the Picture Post years and invited him to become his photographic biographer," Elçi said. "The intimate images that resulted from this assignment show Benjamin Britten at play or rehearsing at the grand piano in his country house, surrounded by his friends. These final images are emblematic for Kurt's work and are a fitting final chapter for his life's work." Ernst Schlogelhofer, who brought together his archive working with Getty Images Gallery in London, will give a talk about the artist and his era at Leica Akademie Istanbul on Jan. 28. "Hulton Archive, Getty Images, London and Mr. Schlogelhofer helped us put together this show and gather the background story for his work," Elçi said. "Hutton's story still resonates today and his imagery is crucial to understand Europe's social life after the war."